TORONTO, Feb. 17, 2018 /CNW/ - Spin Master Corp. (TSX: TOY; www.spinmaster.com), a leading global children's entertainment company, has been recognized for three Toy of the Year (TOTY) Awards at the 2018 North American International Toy Fair in New York City. 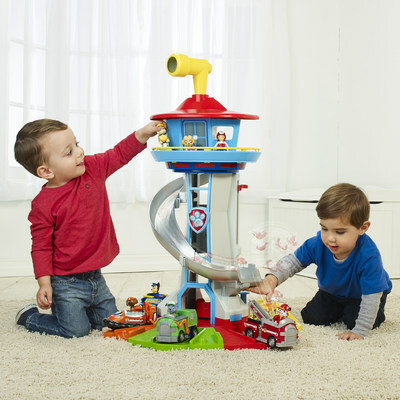 Continuing Spin Master's legacy of industry recognition for its innovative portfolio of brands and products, Spin Master received three TOTYs following nine nominations across seven categories: Game of the Year – Soggy Doggy, Vehicle of the Year – PAW Patrol Sea Patroller and Preschool Toy of the Year – PAW Patrol My Size Lookout Tower. "We are honored to accept these prestigious awards. ‎Spin Master is committed to delivering a great play experience to children everywhere," said Ben Gadbois, Spin Master's President and COO. "This year's awards serve as a testament to our dynamic internal and external teams who continue to push the boundaries on what is possible to deliver inspirational moments." 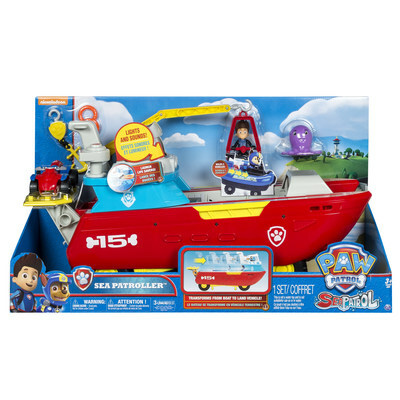 The toy, game and licensing winners of the 2018 Toy of the Year (TOTY) Awards were unveiled by The Toy Association at the TOTY Awards on Friday, Feb. 16 at the Ziegfeld Theatre in New York City. The celebration kicked off the 115th North American International Toy Fair taking place from Feb. 17-20, in which Spin Master is set to showcase its most diverse product portfolio yet. This year's awards follow Spin Master's 2017 Toy of the Year wins for: Innovative Toy of the Year for Hatchimals; Vehicle of the Year - Star Wars X-Wing vs. Death Star, Rebel Assault branded Air Hogs and License of the Year for PAW Patrol. To date, Spin Master has received 92 Toy of the Year nominations, and won 24 TOTYs across all categories, including 13 nominations for Innovative Toy of the Year - more than any of its competitors. At this year's UK Toy Industry Awards in January, Spin Master won four coveted UK Toy and Supplier of the Year Awards: Collectible of the Year for Hatchimals CollEGGtibles, Doll of the Year for Luvabella, Pre-School Toy of the Year for the PAW Patrol Basic Vehicle, and the prestigious Supplier of the Year award. Starting Feb. 17, media and influencers are invited to visit Spin Master at the North American International Toy Fair 2018, Booth #1635 to experience the Toy of the Year award winners firsthand. 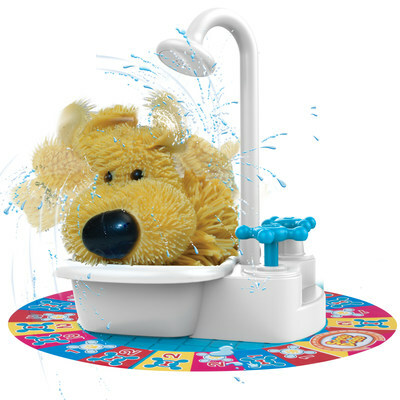 Spin Master (TSX:TOY; www.spinmaster.com) is a leading global children's entertainment company that creates, designs, manufactures, licenses and markets a diversified portfolio of innovative toys, games, products and entertainment properties. Spin Master is best known for award-winning brands including Zoomer®, Bakugan®, Meccano®, and 2017 Toys of the Year, Hatchimals®, Air Hogs® and PAW Patrol®. Since 2005, Spin Master has received 92 TIA Toy of The Year (TOTY) nominations with 24 wins across a variety of product categories, including 13 TOTY nominations for Innovative Toy of the Year, more than any of its competitors. To date, Spin Master has produced six television series, including 2007 success Bakugan Battle Brawlers and current hit PAW Patrol, which is broadcast in over 160 countries and territories globally. Spin Master employs over 1,500 people globally with offices in Canada, United States, Mexico, France, Italy, United Kingdom, Slovakia, Poland, Germany, Sweden, the Netherlands, China, Hong Kong, Japan, Vietnam and Australia.